This monograph publishes the 523 coins recovered in an excavation of Regio VIII, Insula 7,1-15 in Pompeii, investigated between 2005 and 2009 by the “Pompeii Archaeological Research Project: Porta Stabia” of the University of Cincinnati. Studying money in Pompeii certainly means assessing the importance of this medium of exchange in the economic and social activities of the ancient world, and investigating its flows, the ways in which it was used, and the contexts in which it was found. But it also means shedding light on a cultural history, that of a Mediterranean which back in those times, in spite of wars and disagreements, communicated much better that we are able to do today, a sea across which human beings, commodities and ideas traveled, as well as, of course, coins. Indeed, throughout the life of Pompeii was characterized by a heterogeneous and prominent presence of “Mediterranean” money. Studying the money used in the Vesuvian city means trying to recover and shed light on the role of money as a “social object”, a role it played in the ancient world and still does today, although in significantly different ways. 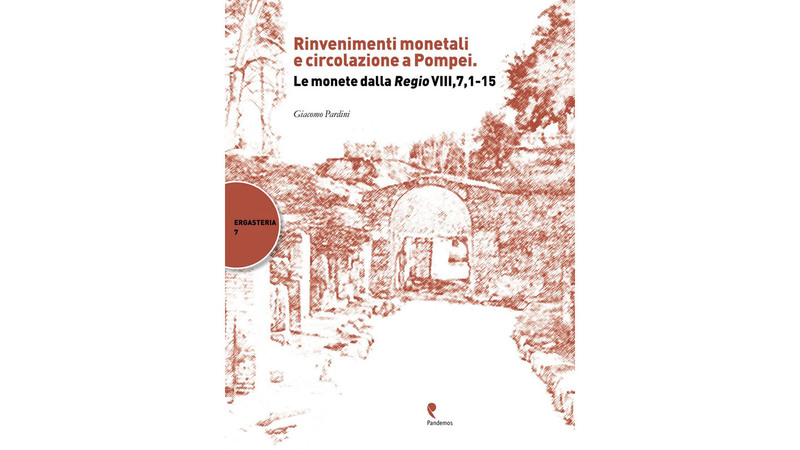 This book aims to provide an up-to-date overview of the presence and circulation of coins in Pompeii between the fourth century BC and AD 79. Although the stratigraphic investigation of, and the materials from, Regio VIII, Insula 7,1-15 are still unpublished, I have tried to put the coins found here back into the context of their respective historical periods. I therefore provide a general periodization of the numismatic evidence under study. This restoration of the diachronic context has allowed me to make a series of considerations – which may be perfected in later studies – on the behavior of money in different stages in the town’s life, highlighting its evolution and modes of circulation. By “(numismatic) context” I therefore refer here to the whole corpus of coins unearthed in any period or phase. I have devoted special attention to a group of coins occurring very frequently all over the Vesuvian area, including Pompeii itself – as well as in the area of the Province of Salerno all the way to Velia, although in less significant numbers than in the ager vesuvianus – namely, the coins of Ybshm/Ebusus and Massalia, and a group of local imitations thereof. These coins appeared around the middle of the second century BC and remained in use until the early imperial period. I have investigated their chronology and distribution within Pompeii to throw light on the reasons for their arrival in Campania and for the production of this necessity coinage, which mainly imitates types of the Balearic island and the cities of the Gulf of the Lion. In line with the approach adopted in my PhD dissertation, I turned to the exact sciences for answers to certain questions and, at the same time, experimented with scientific investigation methods to improve knowledge of this numismatic evidence and thereby allow it to be adequately conserved and made better known to the general public. These archaeometric investigations mainly focused on the above-mentioned group of coins. The aim was, on the one hand, to order them by sorting them into types and defining objective elements distinguishing prototypes from copies, on the other, to reply to the questions that constantly trouble numismatists: Who minted these coins? Where and when were they produced? How, when and how much did they circulate? Giacomo Pardini is a Research Fellow in Ancient Numismatics in the Department of Cultural Heritage Science at the University of Salerno, where he teaches graduate level courses in Ancient Numismatics (http://docenti.unisa.it/029260/home). He has an undergraduate degree in Lettere Antiche (with a focus in Methodology of Archaeological Research) and an M.A. in Classical Archaeology (with a focus on Greek and Roman Numismatics), both from La Sapienza University in Rome. He holds a Ph.D. in Methods and Methodology of Archaeological and Art Historical Research from the University of Salerno. During the 2014-2015 Academic year he was a Margo Tytus Visiting Fellow in the Department of Classics at the University of Cincinnati (OH-USA). He has taken part in numerous archaeological excavations in Rome (Meta Sudans and North-eastern slopes of the Palatine), at Monteleone Sabino-RI (Trebula Mutuesca), and in Syria (Tell Barri/Kahat), holding leadership positions. His research focuses on the relationship between archaeological contexts and ancient numismatics, the interpretation of coins from excavation, monetary circulation in antiquity, and ancient trade. He authored several papers on coin findings in particular from Rome and Pompeii, on the Augustan Meta Sudans, and on the Curiae Veteres sanctuary in Rome.